Every four years, Nissan hosts an event it calls Nissan 360, a month-long event in which media and special guests are treated to an automotive spectacular in which the global brand lets them get hands-on with nearly every vehicle the company builds. 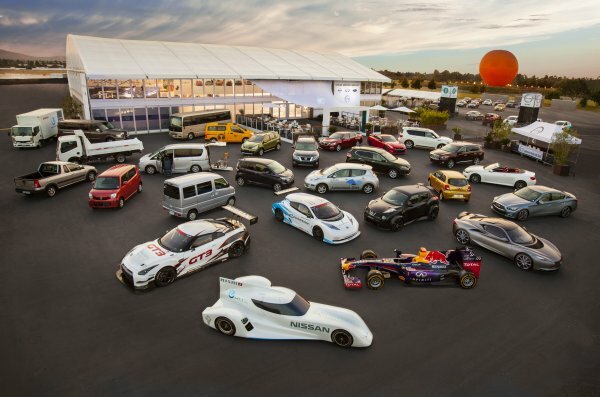 Every four years, Nissan celebrates its birthday with a showcase of its latest and greatest vehicles at a month-long event it calls the Nissan 360. This year, the event was held in Southern California from mid-August to mid-September and featured over 100 driveable vehicles from around the globe, including some from the newly-revived Datsun brand. The event drew invited guests from around the world as well, including about 800 media representatives and a total of more than 1,500 guests overall coming from more than sixty countries in Europe, Asia, Africa, and the Americas. Between them, those who attended made over 15,000 test drives for more than 30,000 total miles, which is equivalent to driving around the Earth. Vehicles on hand to drive by attendees included everything from the big Nissan Civilian minibus to the latest kei mini-cars from Japan and even the powerful GT-R supercar. One of those cars that caught a lot of media attention was the Nissan LEAF Autonomous Drive car, which the company says will be ready for the public by 2020. All of these cars were driven on some of seven total tracks representing various surface types from race track to streets to offroad hill climbs and mud. There were also 32 display vehicles hailing from various Nissan departments, including its heritage museum, motorsports departments, and more. These included the awesome new Nissan ZEOD RC electric race car that will be in FIA's Garage 56 for the 2014 Formula One series as the latest development of the company's DeltaWing technology of aerodynamics which combines the electric power of the LEAF in a range-extended electric race machine. With over 1,500 participants in the SoCal summer heat, of course, that also meant that Nissan's local vendor partners served over 1,813 plates of local food while attendees drank 17,459 recyclable bottles of water and scarfed 2,300 servings of Ben and Jerry's ice cream. Nissan 360 was the first in a series of signature events being held to mark the company's 80th anniversary. It demonstrated the best of Nissan: the latest breakthroughs in vehicle technologies and detailed presentations about business strategies. The event exposed attendees to the stories that lie behind the innovative and exciting products and technologies that are driving Nissan's future growth — and making it a company to watch. TorqueNews hopes to be invited to the next one!